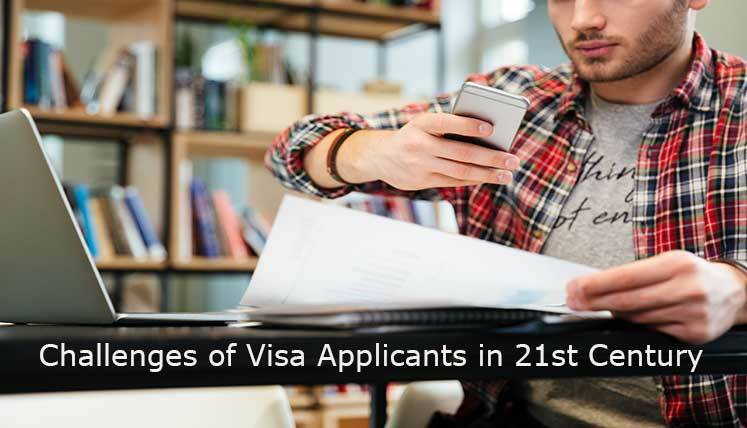 What are Challenges of Visa Applicants in 21st Century? The overseas immigration is a peak in view of limited opportunities in the developing countries. However, the aspirants of immigration to overseas countries, i.e. Canada, Australia, New Zealand, etc. have to face many challenges in the 21st century. The applicants are somehow dealing with these challenges to make their way to their desired immigration destination. Let’s find out what are the challenges being faced by immigration applicants and aspirants and how to deal with the same. Today, not all advanced nations have the lenient policy on immigration and immigrants. In fact, most of them are finding ways to control the number of immigrants in the country. The immigration associated announcements in the recent past from USA, UK, etc. countries often indicates the tough stand of these countries on immigration. This has reduced the immigration options of the applicants and resulted in increased competition as well. This particular aspect is related directly to the first reason given, i.e. immigration policies of advanced nations. Due to the change in immigration policy, the immigration rules and procedure of many advanced nations, i.e. USA, UK, Australia, Denmark, etc. have become stricter. This has become a major challenge for immigration applicants, as they have to earn enough points on the immigration point grid of these countries to make their candidature worthy of receiving visa approval from the immigration authorities. The bogus or fraud immigration agents or agencies are only adding to the problems of applicants. The complex immigration process and changing immigration rules, force the applicants to hire an immigration consultant, however, not all immigration consultancy services are genuine and registered. There are some fake agents and agencies active, which mislead the visa applicants to make easy money from them. The applicants who get trapped by such agents, not only lose their money but also face the delay or denial of visa application and even legal complications in the worst scenario. Well, if you take care of one issue among the above, it may help you deal with the above challenges as well. If you are able to get a genuine and trusted immigration consultant, it will help you negotiate all the above challenges. A genuine Visa Consultancy service with a team of certified immigration experts and professionals, not only help you deal with tough immigration rules and policies but also becomes your true and reliable mentor and guide for overseas immigration. Visas Avenue Immigration is one such genuine and registered Visa Consultancy service, which is helping hundreds of applicants in immigration process every year. Most of its clients aka visa applicants obtain visa approval for Canada Australia, New Zealand, etc. countries. If you are looking to apply for a visa abroad, you may get in touch with Visas Avenue qualified Immigration experts for complete immigration process support. You may call Visas Avenue immigration experts on Toll-Free Number- 78-18-000-777 or visit our nearest branch office at Delhi, Bangalore, Hyderabad, Mumbai and Chennai. Alternatively, e-mail your queries to Visas Avenue e-mail id- info@visasavenue.com. What Makes Visas Avenue the Best Consultancy in Chennai for Canada’s Point based Immigration System?